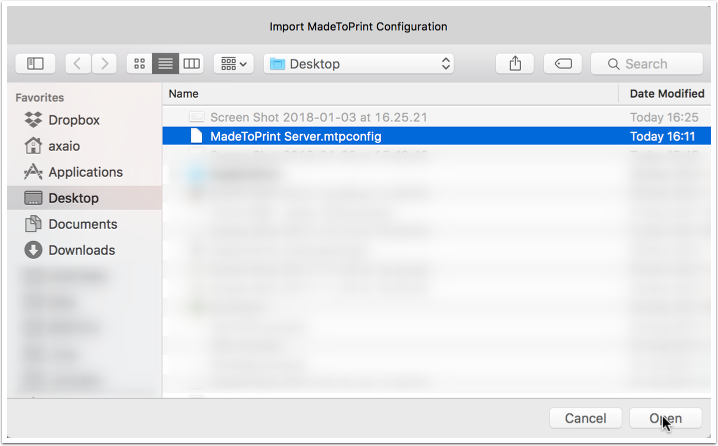 To be able to use MadeToPrint with MadeToPrint Server, the output/print jobs must first be configured with the help of a Desktop version of InDesign and the corresponding MadeToPrint for InDesign – subsequently the setup jobs can be exported and imported with the MadeToPrint Server. Install the MadeToPrint InDesign plug-in on any computer in your network where a Desktop version of Adobe InDesign is installed. Double-click MadeToPrint Plug-In Installer and follow the instructions. Documentation for the Desktop version of MadeToPrint is installed automatically. It is located, depending on the CS/CC version, under User/Documents/axaio software documentation (Mac) and under Program Files/Adobe/Adobe Indesign CS6/Plug-Ins/axaio software/MadeToPrint Documentation/ MadeToPrint_InDesign_Manual.pdf (Win). Configure the print/output jobs according to your requirements. You can also export a complete Configuration, including print jobs, auto jobs and all assigned assets like scripts, presets and PostProcess profiles. From the InDesign menu, choose MadeToPrint Configurations -> Manage... to open the configurations manager. Even if you have set up multiple connections, the server UI is only connected to one (selected in the main windows) and will only import Jobs to that selected server. 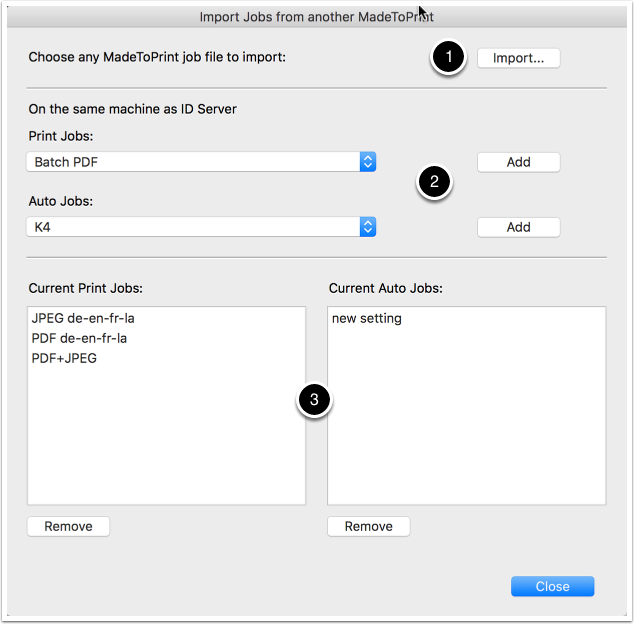 To import single print jobs or auto jobs, click onto the Import button (4, see above) in the MadeToPrint Server UI. This MadeToPrint UI is devided into three sections. 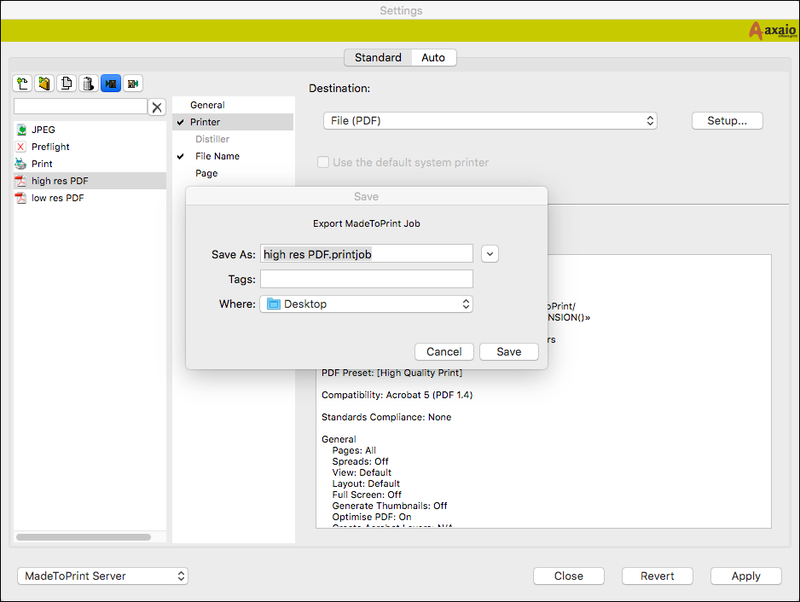 (1) In the top part of the window, you have a button to Import print job files and auto job files which you have been exported from a Desktop MadeToPrint. 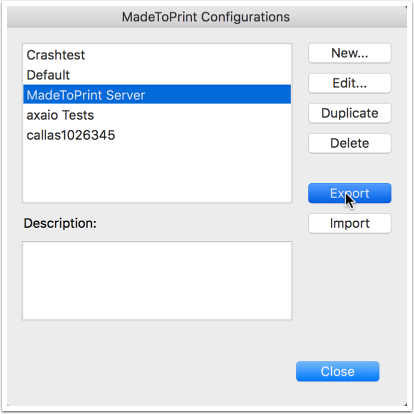 (2) The center area displays print jobs and auto jobs which are available from a desktop MadeToPrint, which is installed on the same machine as the MadeToPrint Server plugin. To add any of those jobs to the MadeToPrint Server plugin, select the one from dropdown and click Add. (3) The lower area does list the actual print jobs and auto jobs which are installed in the MadeToPrint Server to which cu are currently connected. You can also choose to import complete configurations. Therefore, in the main MadeToPrint Server UI, click the "Configuration" button. (1) The dropdown will show available configurations in the MadeToPrint Server UI. You can also choose to change the active configuration in the MadeToPrint Server plugin. 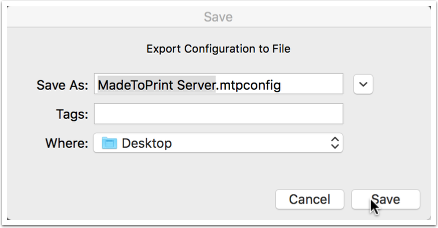 (4) To import a new configuration, click Import... and choose a .mtpconfig file from your hard disk, which you have exported before from within the Desktop MadeToPrint. Click Open to send the configuration to the server and activate it. 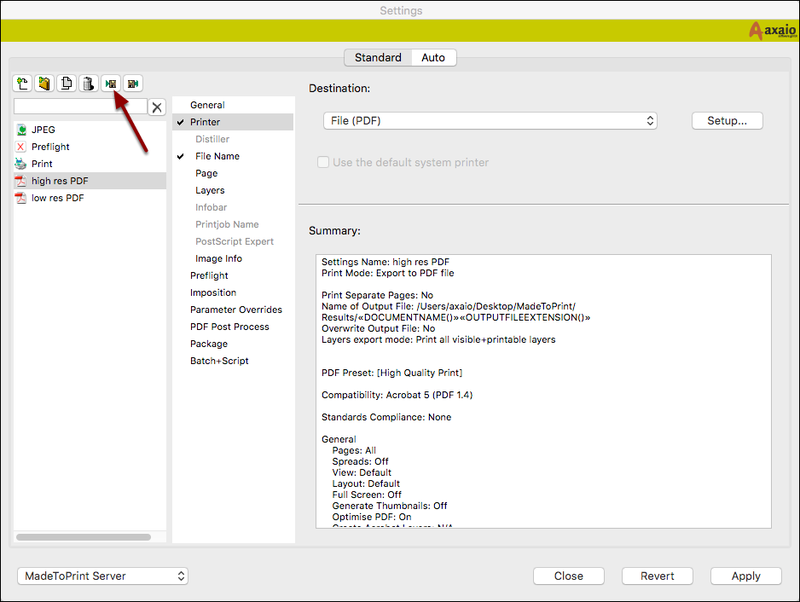 In case a PostScript printer is being addressed within a print job, MadeToPrint Server users have to make sure that the printer determined within the imported print job is installed and properly configurated on the computer with the MadeToPrint Server on it. By “Print Job” we mean the output jobs where the user defines which output format (PDF, EPS, PostScript, JPEG, IDML, INX (CS3/4), Flash CS4/5, ePub etc.) is to be created, which printer is to be activated and where the files to output are to be written. 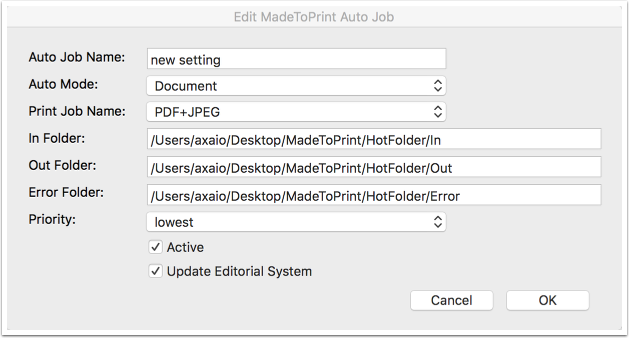 By “Auto Job” we mean the output queues that always consist of an IN, an OUT and an ERROR folder – they help add InDesign documents to a specific print job and thus to pass the original file through the MadeToPrint production.